These Heirloom Tomato & Grilled Eggplant Stacks are fresh, local, seasonal, and delicious to the last bite. Aaah, Summertime! Gardens are bursting, Farmers’ Markets are in full swing, and – Glory Be! – tomatoes taste like… tomatoes again. Don’t you just love it!?! This time of year, I aim to create dishes that highlight the bright, fleeting flavors of summer, and these Heirloom Tomato & Grilled Eggplant Stacks are just the ticket. Uncomplicated in every way, they are deeply satisfying, and delicious to the last bite. Peel eggplant (unless yours has a very thin skin). Slice into 1/2-inch rounds. You will need two large or four small rounds per stack. Brush eggplant with olive oil and season with salt and pepper. Grill the eggplant rounds over medium-high on barbecue or in grill pan on stove until tender (about 10 minutes) turning once. Allow to cool completely. Slice each tomato into four rounds. 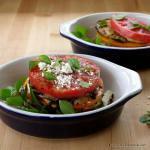 Alternate tomato and eggplant slices, beginning and ending with a tomato slice. If the eggplant slices are too small, just use two for one layer. Sprinkle each completed stack with a teaspoon of olive oil and two teaspoons of balsamic vinegar. Season each stack with a pinch of kosher salt and a turn of freshly ground pepper. Garnish with feta and fresh basil. Stacks can be prepared as much as a day ahead of time. Do the final prep (olive oil, feta and basil) right before serving. Ooh, sounds delicious! I love having new things to do with the amazing fresh tomatoes we get in our CSA and sometimes garden this time of year. This dish looks absolutely delicious and very healthy too! I am not so much into tomatoes but heirloom kind are definitely my favorites and I LOVE eggplants… no matter how they are cooked, just love them! I actually want to try and make baba ganoush recipe. Have you ever had that? I love the heirloom tomatoes – they seem to have so much more flavor than their bio-engineered counterparts, and this time of year they are so sweet and luscious. Just a side note: I made a simple tomato-feta bisque last night with the leftovers from this post, and it was fantastic. As for baba ganoush, I’ve made it many times – it is so easy! I will have to write up a post for it. Thanks for the idea! I don’t think I’ve ever actually eaten eggplant! This looks like a nice recipe to have on hand for when we host some of our vegetarian fans! We picked all the veggies for these up at the Hollywood Farmers Market [Portland] last Saturday. We’ve never been to that one before, but I know we will be going back – there was such a wide selection of beautiful veggies and fruit. 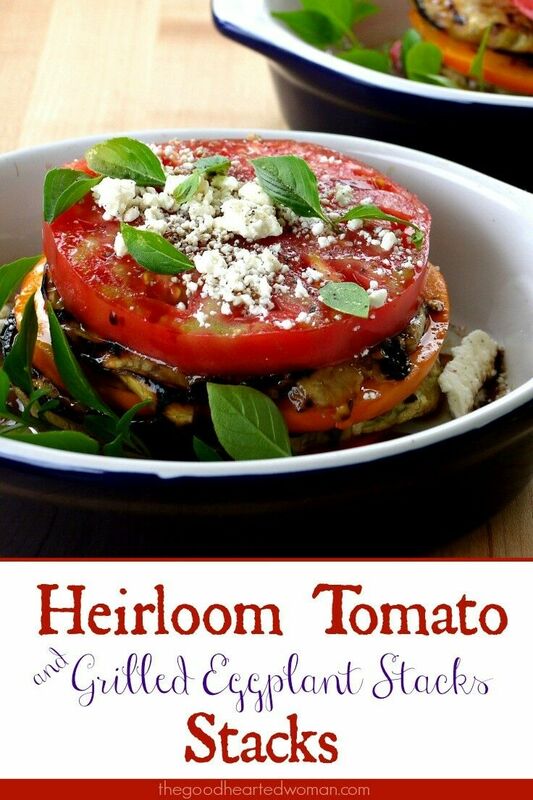 I love heirloom tomatoes too! This looks fabulous.